I love my patisserie cakes and everything sweet and this blog may allude you to thinking it is ALL I eat, well truth be told I generally eat fairly healthy for the most part. Almond milk is my daily routine, it kicks starts my mornings before I have my espresso. A good almond milk smoothie will keep me fueled for most of the morning. This recipe is very easy and much more nutritional than the supermarket shelf brands. Sometimes I mix in a tablespoon of raw cacao powder or soaked goji berries. The next day, drain and rinse the almonds. Place in a blender with the water and blend on smoothie mode or high. Use either a cheese cloth or sieve to press the almond milk through. The end result is a lovely fluffy textured milk. 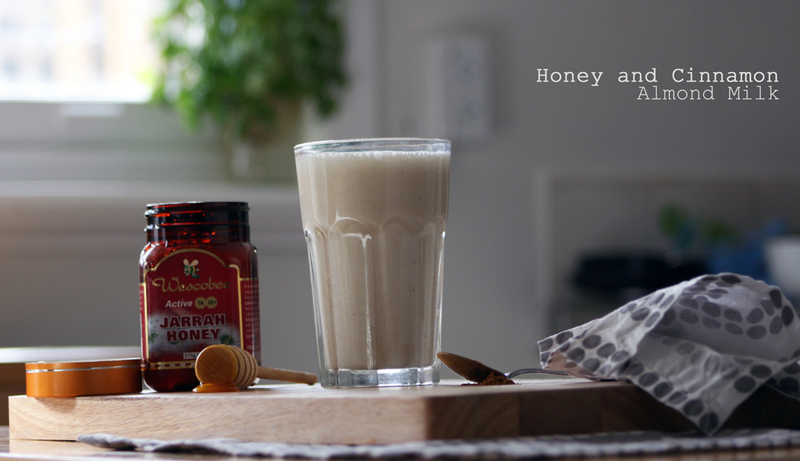 Then place the almond milk, 2 bananas, 1 teaspoon of cinnamon and half a tablespoon of honey into the blend. Blend it all on smoothie mode.